Reliance Communications customers were unable to access Facebook, Twitter and other sites for several hours on Saturday after hacker group Anonymous reportedly hacked into the Reliance servers. 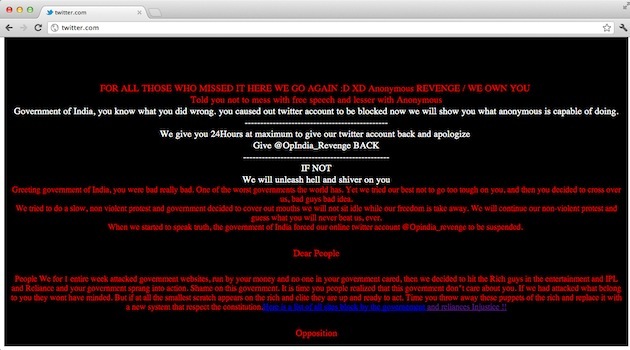 As the screenshot says, Anonymous' latest step is to protest against the suspension of their old Twitter page, which Anonymous alleges was done at Government of India's behest. The message from Anonymous goes on to criticize the Government for colluding with the ISPs and censoring the internet. Anonymous has been tweeting against the Department of Telecom and Internet Service Providers like Reliance. The hacktivists are opposed to torrent sites being blocked by companies who get court orders to prevent pirated content from being shared at sites like Vimeo, DailyMotion and others. 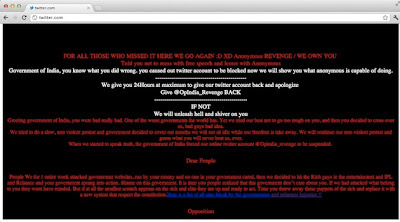 On Friday, Anonymous held a press-conference via an Internet chat in which it criticized Reliance on similar grounds.